A visit to the museum turned into a Spanish learning opportunity for both my son, and his Spanish speaking friend. 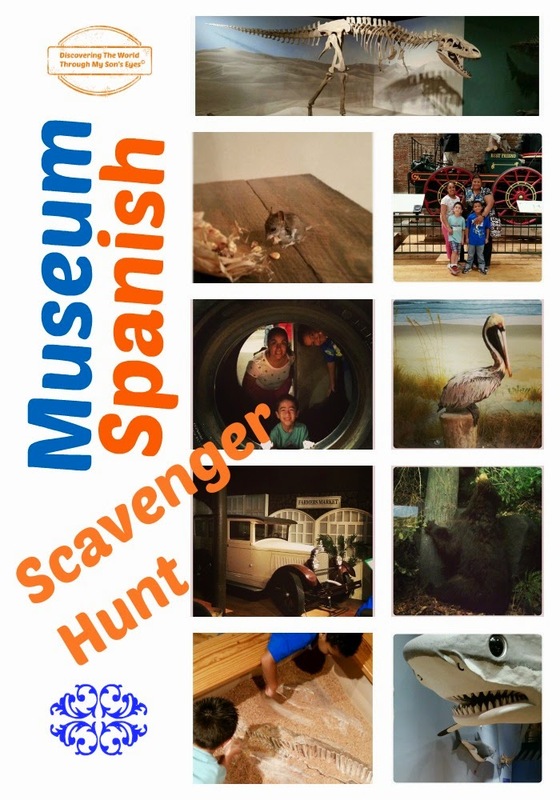 Prior to the play date, I was looking on-line for a Spanish museum scavenger hunt printable that I can use with the boys. Unfortunately, I came up with nothing. However, I did find a generic museum scavenger hunt, but it was in English. I used some of the words that I found here, and translated them into Spanish. After a quick search on the museum’s website I added a few more words in Spanish, and I must say the final result was awesome!! The boys had a great time running around the museum doing the scavenger hunt, especially when I’d asked, ¿puedes encontrar…? We visited the South Carolina State Museum. The museum has art, natural history, science and technology, cultural history, and American History. We spent most of the morning in the museum, and then we went to lunch. Then we made a stop at an indoor bouncy slides, and jumpy houses for them to play. Planning a visit to the museum? Download the free printable here!